You are here: Home / Uncategorized / The Scale: Friend or Foe? 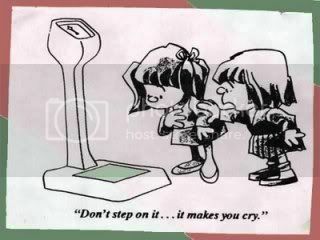 I have a love hate relationship with my scale. When my number is good I love it but when my number is bad (aka goes up) I hate it. My scale has the ability to make my day or ruin it. My scale has the ability to keep me focused ad on track when used properly but it also has the ability to become a tool for obsession. Monday my number ruined my day, not only did I workout hard all of last week but I maintained a healthy diet for most of it too, only to be disappointed greatly by the number on the scale. I’m thinking my scale has way too much power! My meltdown on Monday morning courtesy of my scale was the perfect example of why a scale is not helpful in all instances and for all people. I literally had gained 3 pounds overnight and to say the least I was less than thrilled. As a nurse I know 3 pound weight gain is not fat, it is just not physiologically possible to gain 3 pounds of fat in one day (at least not in my case, maybe if I had joined a hot dog eating contest or something which I did not do). I also know that the most likely cause of my weight gain is fluid retention and in this particular case it is most likely related to hormones but my irrational side still took over thus my day was ruined. I so wanted to see a weight loss to build my confidence, to make me feel good about myself and to feel accomplished but that didn’t happen…so what??? Why does one little a number have so much power? I believe there are definite pros and cons to a scale and I also believe that for some people a scale is a very useful tool but for me not so much. Studies show that people that weigh themselves daily lose more weight and keep it off but at what expense? For me personally if I weighed myself daily I would just drive myself crazy…so I don’t. Weighing myself once a week is the most I can tolerate and I am thinking that I may even stop doing that because it can make me crazy too, just like it did this week. I find other measurements such as how our clothes fit and actual body measurements are a much better indicator of progress that a number on a scale. Plus just feeling healthy and fit should be enough. What I have learned this week is that I am not going to allow a number on a scale to control how I feel, I am going to take it with a grain of salt and see it for what it is….just a number. For the purpose of my 30 day challenge I was weighing myself weekly but I now think I am just going to do a weigh in at the end. I will not let a number control me, I plan to just go by how I am feeling and right now I feel great! Do you weigh yourself and how often? Does the number on the scale affect the way you feel about yourself? I rarely weigh myself because I usually expect something that doesn’t come and I get upset. I prefer to just use my clothing as my guide. If I have to jump up and down to get my jeans on I better run a few extra miles that week. Happy Thanksgiving! When I moved to New York after college, I trashed my scale and haven’t gotten a new one since. I’ll occasionally weigh myself at the gym, but I always take it with a grain of salt. I don’t have a great relationship with the scale so I’ve learned to base my healthy weight on how I feel and how my clothes fit. I used to weight myself daily, and it was a helpful tool but messed with my emotions for the day? Once a week works better for me.